from 60 pcs. 0.22 CHF ea. from 140 pcs. 0.19 CHF ea. from 360 pcs. 0.17 CHF ea. More than 10 million sold! 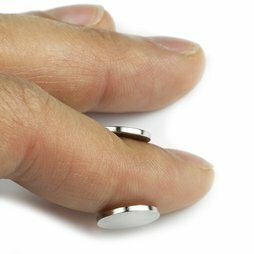 A small and very flat disc magnet with an adhesive force of 0.5 kg. We also carry this magnet in self-adhesive form.